55 pages, 8.5" x 11", Four-Color, English & Others, 2011. Originally published by Iris Lohan, 2011. News: Now updated to a completely new 2nd Edition in Chinese, English, Italian, and Russian. Thanks again to Iris Lohan for following through with all the work. 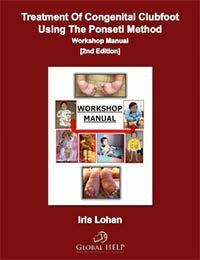 This manual, customized primarily for a Chinese audience and written in an easy-to-understand style, serves as a solid and practical guide for practioneers using the Ponseti technique to treat congenital clubfoot. Extensive photographs and drawings help to get the hand-positions for manipulation and casting right. Italian translation by Sergio Monforte & Centro Ortopedico Essedi. Polish translation by Mariusz Chomicki. Russian translation by Vladimir Kenis.